Girls Hostel is established in the year 2002 to provide accommodation and mess facilities to students of Sir C R Reddy College of Engineering. The hostel accommodates about 500 students. Each room is attached with separate Bathroom. The rooms are furnished with Cots, Fans, Tables, Chairs and Shelves with Iron doors. Washbasin with mirror and Mosquito nets to window frames are also furnished. Hygienic drinking water is available to the inmates of the hostel. Kitchen with modern cocking facilities and spacious dining hall is provided for inmates. 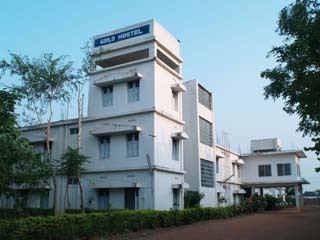 Common Telephone, Reading room, Indoor sport facilities are provided to the hostel inmates. Non A/c Guest rooms for College Guests/visitors are available in the hostel. Solar heating systems are planned in this academic year. Co-operative store sports and medical facilities to the inmates are available in the college campus. A 24-hour security is available to the inmates of the hostel to protect the hostel property and to report incidents that require immediate attention to authorities. Inmates of the hostel select a mess committee from among themselves to run the mess and help in hostel administration. A resident warden stays during nighttimes and checks the attendance of the inmates after 9 pm every day. Note : Mess Bill will be generated based upon Monthly expenses.